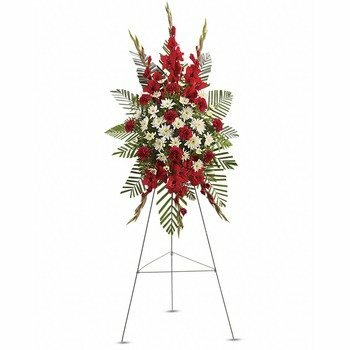 Your concern and love will be deeply felt by the family at the memorial service when they see this beautiful spray of classic red and white flowers. At a time of loss, it is an eloquent expression of sympathy more powerful than words. * Have used 1st in flowers for a couple of years now. Service is excellent and they deliver what they promised. * I have used 1st In Flowers before and I have been highly satisfied with the service I have received from them and I will continue to use them whenever I need their services, as all people are aware you always go back to the people who look after you.